The journal publishes the results of scientific researches, focused on contemporary issues of public and municipal finance management. 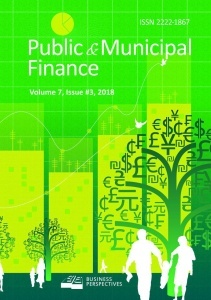 The Editorial Board gives the privilege of publication to the original and innovative manuscripts, which examine the following areas: formation of local budgets, implementation of state and local taxation systems, impact of state financial policy on the investment attractiveness and the economic potential of the region, general trends in legislation and local government, history of cities and retrospective analysis of the urban evolution, etc. The target audience of the journal includes researchers, scholars, lecturers, students, and practitioners. Key topics: State and Local Budgets; Budgetary Policy (formation of budgetary revenues, optimization of budgetary costs, procedure of budget preparation); Interrelationship between budgets of different levels (state, region, city); Taxation systems (state and local); Budget and non-budget funds; Formation of state and municipal finance; Private sector and economic growth; Economic and investment potential of the region; Legislation and local government; Retrospective analysis of the urban evolution; Econometric and statistical methods in public and municipal finance; Econometric modeling; Financial forecasting and simulation; Government policy and regulation in financial sphere; Management of public and municipal financial institutions.